We are in the thick of summer, and today is National Hot Dog Day! What better excuse to fire up the barbeque and enjoy one of the most classic American treats? I’m a firm believer in not depriving myself of the occasional treat, but we can still be proactive and make some of our favorite junk foods more healthy and provide ourselves an opportunity to consume essential nutrients. The health risks associated with consuming processed meats has been brought to the attention of Americans for the past couple of years. 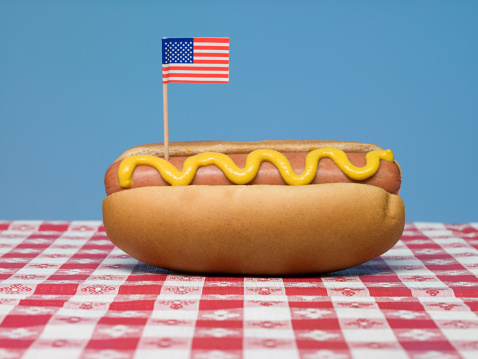 And although hot dogs should not be a staple in your diet, there are a few things you can do to celebrate National Hot Dog Day in a healthier way. Choose “nitrate/nitrite free” or “uncured” hot dogs at the grocery store. “These hot dogs rely on natural sources of nitrate, often celery juice, extract, or powder,” according to the University of California, Berkeley. Nitrates and nitrites are preservatives added to processed meats, including bacon. Several medical studies have linked nitrates and nitrites to an array of diseases including cancer, Alzheimer’s and heart disease. Just by selecting a brand of hot dogs without these preservatives, you can make your hot dog significantly healthier. And you probably won’t even notice a big difference in taste. Swap ketchup for diced tomatoes. Lots of ketchup options you find in the grocery store have a lot of added sugar. There are some organic ketchups that are better but to make your hot dog even healthier add diced tomatoes, which provide lycopene without the added sugar. Lycopene is an anti-inflammatory compound. According to the National Institutes for Health (NIH), dietary lycopene has been associated with decreased risk of death from prostate cancer. Swap relish for diced cucumber. A lot of relish products have added sodium and sugar. Diced cucumber will add a nice, refreshing crunch and provide nutrients including fiber, potassium (which helps control blood pressure) and vitamin C.
Add avocado. Along with adding flavor and texture, avocado provides multiple essential vitamins and minerals including magnesium (which helps lower blood pressure) and phosphorus (which has shown to help people maintain a healthy weight). Avocados are also a great source of monounsaturated fatty acids which, according to the Mayo Clinic, may help lower your risk of heart disease. Add sauerkraut. Sauerkraut, a form of fermented cabbage, will add a bit of tang and has anti-inflammatory properties, which we all need to help protect ourselves from free radical damage and oxidative stress. Sauerkraut is also rich in beneficial probiotics, including lactobacillus bacteria, which improves digestive health and encourages the growth of good bacteria in your gut. For a Korean inspired hot dog, add kimchi, another fermented cabbage rich in probiotics. Swap shredded iceberg lettuce for shredded romaine lettuce. Romaine will deliver the same refreshing crunch iceberg lettuce will, along with more nutrients. Romaine is highly rich in vitamins A and C, which are powerful antioxidants. This green is also rich in vitamin K, which may help prevent bone loss. Swap the white bread bun for wheat or multigrain. Wheat and multigrain buns generally provide more heart-healthy fiber and have fewer calories than white bread. Swap the classic fries for sweet potato fries. If you are going to have a hot dog, you will likely want fries with it. And as delicious as they are, most fries in restaurants and at fast food joints are fried in oil. They are salt and fat bombs. For a healthier alternative, make oven-baked sweet potato fries. Just toss the sliced sweet potatoes in olive oil, sea salt and pepper and pop into the oven. I like to add garlic powder and cayenne pepper for extra flavor and spice. Sweet potatoes are delicious and rich in essential vitamins and minerals as well as polyphenols, which have shown to slow down the growth of cancer cells. If you really like to get creative in the kitchen, click here for other hot dog ideas with more healthy toppings like pineapple and olive. And if you do not eat meat, check out this recipe for a homemade vegetarian hot dog. Even when indulging, you can still make simple, small changes that will benefit your health. You may even discover you prefer the healthier alternatives.